©2017 GSBB Media, LLC. All rights reserved. We are starting to ramp up on our marketing and social media efforts on our forum. After all, a party, or in this case, our 3rd Annual Global Small Business Forum, is absolutely not as impactful unless key people like you — business owners and entrepreneurs — attend. Here's what is in store for our program and why you should attend. 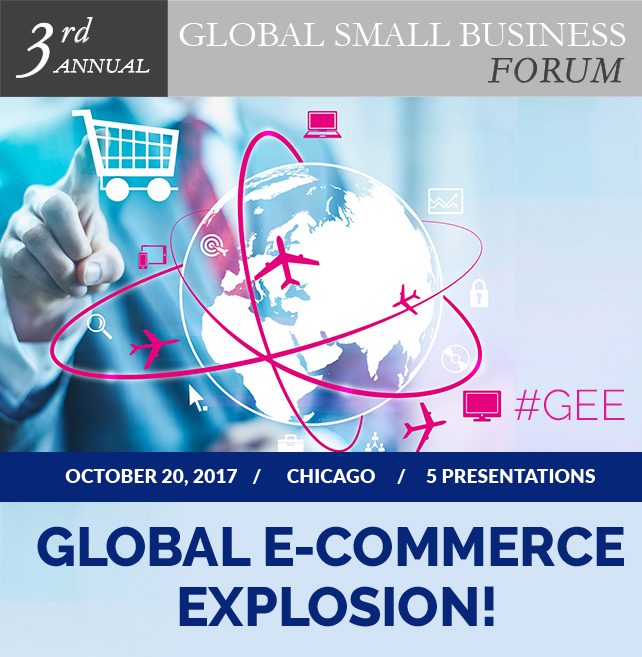 GLOBAL E-COMMERCE EXPLOSION (#GEE)! Third Annual Global Small Business Forum sponsored by: Global Trade Source Ltd.; MB Financial Bank; Center for International Business, Loyola University Chicago, Quinlan School of Business; and supported by the International Trade Association of Greater Chicago and others. Speakers include: Jennifer Bayon, Vice President of International Sales, Paris Presents; Laurel Delaney, President, GlobeTrade; Logan Hanes, International Account Executive, UPS; James Kornacki, Chief Wine Revolutionary, Ullo LLC; Alexander Lans, Founder and CEO, FOAL LLC; Chantal Wittman Meier, Vice President, International Trade Banking, MB Financial Bank; Lil Mohan, Entrepreneur and Academician; Richard Paullin, Executive Director, International Trade Association of Greater Chicago and Chairman, Illinois District Export Council; Marc S. Schulman, President, Eli’s Cheesecake Company; Andrea Sreshta, Co-founder, LuminAID; Robert S. Steiner, District Director, U.S. Small Business Administration, and Ernie Watts, Executive Director, Global Chamber Chicago. Fee: $125 (Students - $75; Vendor Table - $500). For information and to register, please visit: http://globalsmallbusinessforum.com/.